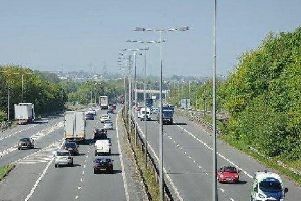 Rush hour commuters are experiencing delays this morning after a car broke down on the M6 between Preston and Lancaster. The vehicle broke down around 8.30am and it is blocking lane 1 (of three) on the northbound carriageway between junctions 33 (Lancaster, A6) and 34 (Kirkby Lonsdale, Heysham, Morecambe). A broken down car is blocking a lane on the M6 between junctions 33 and 34 near Lancaster. Police have closed lane 1 whilst the vehicle awaits recovery. According to Highways England, the incident is expected to be cleared between 9am and 9.15am.